Everything is changing. This is what I keep thinking these days -- that everything around me feels like it's changing. I sit here in Nashville, on this bed with a white comforter that reminds me of home except not. I seem to do my best summer debriefing when I am away -- just far enough, like a plane ride to Nashville, or that car ride last year to Florida. Leaving makes me understand why we stay. I enter an airport and am suddenly nostalgic: grasping at the last bits of summer all the while knowing it's slipping through my fingertips faster than I can catch. I remember that this is why we stay -- because the people we love dearly are reason worth staying for. I entered this summer in a terrified state of mediocrity. That seemed, to me, worse than having a hard time. Even though I had just had my first art show and was utterly dazzled by the kindness people showed me there, I was still strangely scared that I would only ever be mediocre. Show me the good, my heart whispered to God, without my mind being aware of the request. Show me the good. I saw the good while we were dancing at midnight, our lungs burning and throats sore from singing as hard as we could. I'll remember how I felt then: so free, and yet entangled at the same time. Entangled in summer and being twenty-two and knowing those warm, late nights were ending soon. I saw the good in the faces of my friends. When they held my hands and prayed for me, when we laughed until our eyes dripped, when we cheers'd and sang and danced. When the windows were rolled down and we sat by the water and we laid under the stars. 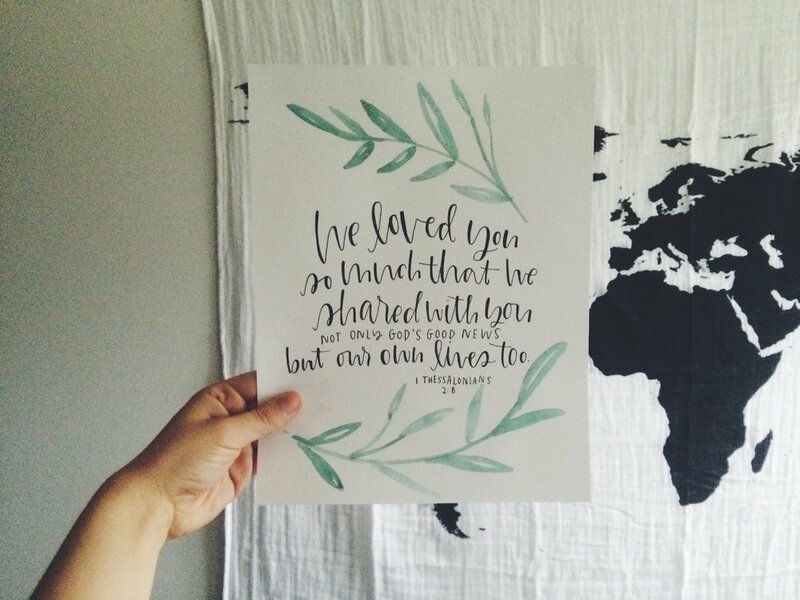 I saw the good when we talked of God's goodness and his remarkable love. I saw the good in California and now in Nashville and when I drive alone in my car. When I prayed the whole way home and God kept urging me to love harder, to love deeper, to love more intentionally -- even when love feels like hurt sometimes. I saw the good this week on the airplane when I read John 10:10 -- I came that you may have life, and have life to the full -- and it felt as though Jesus was telling me, "Aliza, this summer was a glimpse of your life to the full," and I felt like crying because it was such a precious, precious gift. I saw the good in dozens of shared plates of nachos and rounds of Dutch Blitz. In glasses of wine and sitting in the hot tub, and making lists of all the dreams I'd long to have if nothing could stop me. But even when I think of all the good God has continually shown me this summer, the fear still sneaks in somedays. In these moments, when the fear is most evident, my heart feels smashed open. My hands will shake, and so will my insides. I'll think that I'll want to be alone, and two moments later long to be surrounded by people. I'll feel as if I'm falling -- hard and fast, soon to crash and splatter, a million fragmented pieces. I'll sit with my hands beneath me to try and cease the shaking. I'll feel like a quivering, terrified mess of a girl, and I'll feel guilty for feeling this way after seeing all of the good. But in a few weeks, everything is changing. And fear is large and looming and often more recognizable than peace. So I'll take my shaky hands and insides and I'll lie down. And I'll say to Jesus again and again, show me the good. Their only source of water was a three-hour walk from their huts and homes. I was eighteen years old and knew nothing about the world, except what I saw in front of me: dozens of Rwandan children walking to fetch their jugs of water, and they had invited me along. Of course I obliged and followed behind them while the blazing African sun seemed to scorch hotter every second. I was feeling too much — too white, too privileged, and far too out of place. I was holding a water bottle in my hands and guilt wrapped around me like a suffocating fur coat. Who was I to drink water so freely and easily while the kids around me had to traipse for hours to collect theirs? We didn’t speak much on the walk. Their words were in Kinyarwanda, mine were not. When we arrived back at the village after the agonizingly hot and tiring trip, the pastor of their village came to me, his wife not far behind him. They took our hands and led us to their home, a humble thatched hut with benches pulled around a small table. Huge heapings of potatoes and cooked bananas were placed in front of us, and the pastor’s wife shone hospitality in a way I had never seen before. When she handed me my plate, I almost cried. They had nothing, yet they gave me everything. We could hardly communicate with one another — at least not in the typical way I’d been taught. But through that meal where they offered me literally all that they had, the pastor and his wife in a small Rwandan village shared with me two things: their very lives and the gospel of Jesus Christ. I saw Jesus in them, and we barely spoke. They taught me that our lives can speak more than words ever can. May our lives be a poured out offering, an emptying of us and what we desire. May we love so deeply that we reach out our hands and grab the person in front of us, bring them into our homes and give them all that we have. That, I believe, is where the Gospel is most evident. Do you need prayer? Come over to (in)courage and there will be people praying for you. Fireworks are popping outside of my window. Someone probably waited until today to get them 50% off, after the long weekend. They're smart people; fireworks are kind of expensive. But they're always worth it in my books. They do something inside of me when I watch them go off -- all sparkly and crackly and noisy and bright. I am transformed into a five-year-old girl again, the same way I was transformed at Magic Kingdom last summer. I was stunned by everything I saw there, feeling fearless and small and entirely unstoppable. Don't you find that you only have glimpses of feeling that way? Of feeling that wonder? I want to hold onto it tightly before it slips through my fingers. Too often it seems as though the world crushes our wonder before we even realize our wonder was taking place. Or maybe it's not the world who crushes it. Maybe it's just me. I can pinpoint times when I have felt wonder in this way -- the admiration, fascination, marvel, I'm-on-top-of-the-world sort of way: my first airplane ride to Rwanda, sitting on the top of Machu Picchu, standing under the stars, staring at the sea, watching the fireworks pop and loop higher and higher. I wish I could articulate more poetically, or at least more accurately, how I have felt in these times. All I can say is that in each occurrence my chest felt like it was filled with light, and that is when I know I am experiencing wonder. Last night I sat on my blue lawn chair in my old hometown watching the fireworks go, and my chest filled with light again. I was thinking a lot of things: I was thinking how grateful I am that Jesus created emotions that can literally feel colourful and bright and beautiful. I was thinking how I wish I felt wonder more often. I was thinking how it seems as though every time I have felt wonder, it's because I have chosen gratitude. So now I'm wondering if those two just might be connected. Does having gratitude mean having more wonder? There have been too many times where God has given me opportunities and I have gone into them with a closed and ungrateful heart. I haven't felt wonder; I've felt bitterness and disappointment and possibly a sprinkle of resentment. None of those emotions reap anything kind or lovely. I realized this today, while brushing my teeth. I thought: everything is better when I go in with a grateful heart. Everything changes when I alter my mindset from "I have to do this" to "I get to do this". The fireworks are still flying outside my breezy, open window, and I can't help but think that all I want is to keeping finding the wonder around me. But wonder doesn't just come from airplane rides to gorgeous places, or standing on mountaintops, or sitting in a blue lawn chair in your old hometown watching the fireworks fly. Wonder comes from a place of gratitude, from thinking this life is a gift and not a burden. Tonight I step back and survey all God has given me -- this great, great life -- and as I take a deep breath the light is filling my chest again. And this time the wonder isn't just from the fireworks.